I remember my first A/B test. There was a lot riding on this test, too — namely my reputation. I was new in my position, and during our first collaborative meeting with the web team, I’d pretty much put my reputation on the line. The email copy was on display, and I had to take a second look when I read the subject line. “We are sending that?” I asked. Everyone looked at the campaign manager. He nodded. One of the beautiful things about A/B testing (also known as split-testing) is that it can determine the truth of a matter based upon results — not opinions. 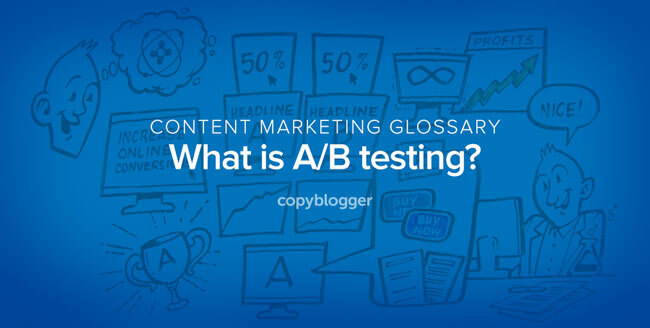 Maybe you are new to A/B testing and you need a primer. A simple definition. With help from our friends at The Draw Shop, we whipped up 12 definitions from our new Content Marketing Glossary into 60-second whiteboard animated videos. Split-testing sounds like something you might find in a secret lab dealing with atoms, protons, and neutrons, but it’s actually a simple, methodical way to increase online conversions. First, create two different versions of a landing page, where landing page 1 features headline A and landing page 2 features headline B. Then, send 50 percent of your traffic to version A, and 50 percent to version B. Observe which version converts better and declare the winner. Take the winning landing page and test another element, such as with or without a video, different colored “Buy” buttons, or a simple sign-up form versus a complex one. The elements you can split-test on a page are endless. And profitable. And the whole process, as you’ll probably discover, can become very addictive. Gr8! But cux am new i just wanna ask….is it like testing live to potential audience? And then testing another element going live then another? Would that be testing everything live and when the time comes to launch we have already run out of audience? Yes, that is what we are talking about. Live audience. Excellent explanation of A/B testing. Few things to remember when testing that aren’t in the video. First, make sure you send enough traffic to have significance. If you only send 50 visitors to each page, and one had 10 conversions to the others 11, that’s not significant. If you have 100 vs 110 conversions out of 500 visits, you’re getting warmer, and so on. Second, make sure you’re sending quality traffic. Don’t send junk traffic just for the sake of getting thousands of visitors. If you’re sending 10,000 visitors and only 2 or 3 convert, you’re not learning anything from your test. Finally, make sure that aside from the element you are testing (such as the headline), everything else on page A and B are identical. You don’t want multiple variations because you won’t know which change caused the increase in conversions. A/B testing takes patience, but worth it if you’re in it for the long run! Thank you for including the transcript! I far prefer reading text to watching / listening, and this text was fabulous — a great addition to my learning. Good for marketing. Video is teaching a beautiful message.